Let’s join the Swedish Metal Convention in Malmö, only one week remained back. Third time the rock exhibition is organized in the city, presenting the rock and metal lifestyle and the feeling of it to everybody, who wanna’ notice the sensation of rock and join it. Rockmässan - Swedish Metal Convention will be held this year on the weekend 26th-27th of October, in Baltiska Hallen nearby the centrum of the city. 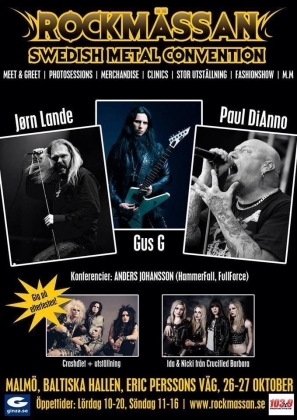 As organizers recommend it, Rockmässan is a kind of every year "meet and greet" event with artists, bands, exhibitors, tattoo parlors, clinics, lectures, exhibitions and much more to see and experience about the rock empire. While in the first year Sebastian Bach, Davy Vain, Crazy Lixx and Gilby Clarke represented the rocking nation in Malmö, next time, in 2012 Sabaton, Yngwie J Malmsteen, Doro, the Sister Sin, Fatal Smile, Jesper Binzer, Udo and Mike Tramp from the legendic White Lion band were the most important guests at the convention. This year it’s promised again to get something special, as the ever first Iron Maiden singer Paul Di’Anno, Jorn Lande, Gus G, and the Crashdiet will act for it. More special, that an afterparty will be held at Distortion Klub, near to the convention in the night of 26th Saturday, starring by Crashdiet. Children from 7 to 14 years could get half price tickets.